Dynaudio have concentrated on high-quality internal and external engineering to create a communicative new ported monitor which isn't afraid to go loud. You can't help but wonder just how many compact nearfield monitor products the market can support. Both new entrants and established manufacturers bring products to the market so fast that keeping up, for anybody, is little short of impossible. 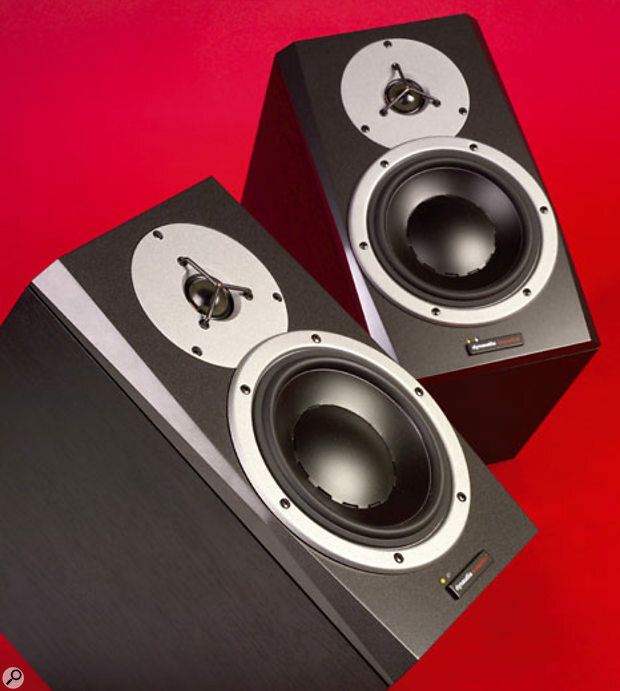 One manufacturer that falls firmly into the 'established' camp is Dynaudio, and the company's BM5A, the subject of this review, is in many respects typical of the rapidly expanding field. 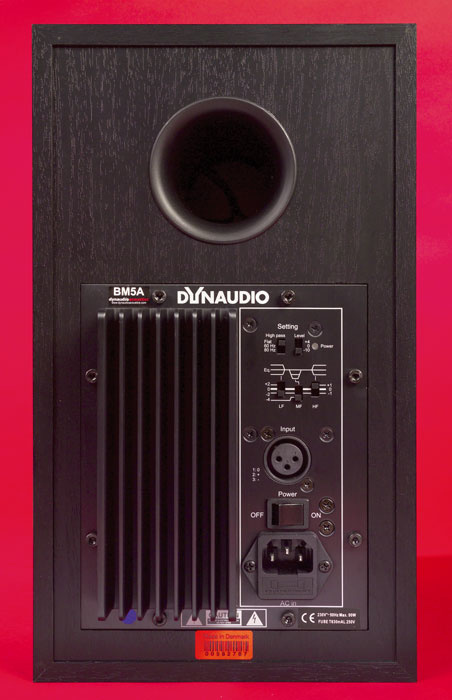 The BM5A is a compact, two-way reflex-loaded system with a 170mm bass/mid-range driver and a 26mm fabric-dome tweeter. A rear-mounted panel carries two 50W amplifiers along with the necessary connection and control facilities. 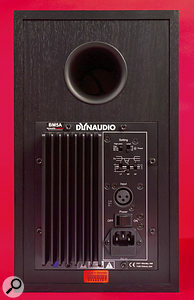 The BM5A's UK price is pitched towards the upper end of the range for the type of product, and it's clear from the speaker's components, engineering, and set of features that Dynaudio have aspirations for it that extend above the project studio to what they'd probably see as more professional applications. 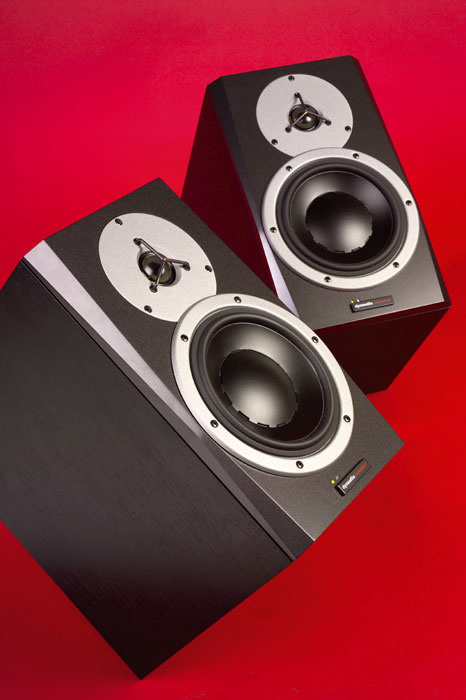 Dynaudio's drivers, for example, have always been engineered specifically for the high-power and low-compression demands of professional monitoring, rather than being inexpensive domestic hi-fi units adapted for the job, and the BM5A continues this tradition. The bass/mid-range driver features the company's external voice-coil construction, which results in a much larger coil than would conventionally be found in a driver of this size — a feature likely to reduce thermal compression significantly. The tweeter is engineered to offer both high power handling and low compression, and it operates over a wider bandwidth than would normally be the case. The standard of engineering necessary to achieve these characteristics doesn't come cheap. While the basic set of connection and control facilities fitted to the BM5A is nothing out of the ordinary, the monitor seems subtly tailored towards the professional applications. Firstly, there is just one balanced XLR input socket provided (no unbalanced jack sockets here! ), and, secondly, there is no gain control provided beyond an input-sensitivity switch with +4dB, 0dB, or -10dB settings. The lack of variable gain control might, on the face of things, seem remiss, but in any truly professional studio setup there would almost certainly be a convenient monitor gain control facility somewhere else in the signal chain. The lack of variable gain controls also brings the benefit that there's less likelihood of unbalanced left and right channels. Continuing the professional theme, the BM5A incorporates some thoughtfully considered equalisation presets selectable via small switches on the back panel. A high-pass filter, designed to aid the BM5A's integration with subwoofers, can be selected to operate at 60Hz or 80Hz. [During the review period news reached the SOS office that TC Electronic are about to release a new subwoofer designed to operate with the BM-series monitors, including the BM5A — Ed.] Also part of the design will be a low-level LFE input/output for daisy-chaining of subwoofers if necessary. One result of the huge number of compact nearfield monitors available is that it becomes harder for manufacturers to differentiate products in terms of their appearance — and this, frustratingly for the manufacturers, at a time when product aesthetics is becoming a more significant factor in success or failure. With the BM5A, Dynaudio have gone for a simple, clean, engineered style that to my mind dovetails well with the market sector the product is aimed at. There's a no-nonsense, serious look to the BM5A that comes from it's heavily engineered and aluminium-look driver chassis, deep cabinet proportions, and semi-gloss lacquered front panel. If the BM5A were a car, I suspect it would wear a BMW badge! Its only concession away from rectilinear shapes is a subtle profiling of the front panel edge thickness that both provides relief from straight lines and perhaps helps a little to reduce acoustic edge diffraction. As far as it goes, I like the appearance of the BM5A. Internal construction of the BM5A continues the high-quality professional theme established by the external appearance and components. I was pleased to see, for example, a reflex port that's flared both internally and externally. And the BM5A is well screwed together, my only minor gripe being the insubstantial nature of the driver fixing screws — wood screws that would only need a little over-tightening before they stripped their MDF pilot holes. After all this positive news it would be a shame if the BM5A disappointed when switched on. But fear not, it didn't. It offers a pretty accurate and professional reproduction of the material it's fed, and despite gentle-slope crossover filters, which result in a wide band of driver overlap, it is relatively untroubled by vertical dispersion inconsistencies. In balance terms I felt happiest in my listening environment with the EQ presets set flat, but experimentation with them confirmed their usefulness. Along with being well balanced tonally, I found the BM5A to be revealing and detailed through the mid-range and high end, with an engaging coherence that helped make sense of the material. Hi-fi enthusiasts would call it 'communicative', which is actually not a bad term to explain what I mean. The BM5A also seemed, as expected, completely untroubled by being asked to play loud. Its balance remained consistent and signs of distress only became apparent at a volume level in my smallish room that I'd personally not be able to tolerate for long. If pushed, I'd make just one critical observation; on occasions I experienced the usual feeling when faced by a ported speaker that bass transient accuracy had suffered a little in the search for bass extension. So what if, rather than the market for compact monitors being full to overflowing, the Dynaudio BM5A were the only contender; would I hanker after some yet-to-be-designed alternative? Nope, I'd be perfectly happy with the BM5A. One of the many clear advantages of active speakers over passive is that the interface between the drivers and their driving amplifiers is firmly defined. Knowing exactly how powerful the amplifiers are and precisely the thermal and excursion-limited power handling of the drivers means that effective and worthwhile driver protection can be incorporated. With passive speakers, effective protection is almost impossible — it just can't accommodate the almost limitless variety of possible amplifier and driver combinations — but with active speakers it can work well. The BM5A takes advantage by incorporating a full complement of protection features for both drivers. In the case of the tweeter, a mute circuit kicks in if the current delivered exceeds a preset level. And in the case of the bass/mid-range driver, a limiter circuit reduces the excursion if the extremities are approached. Along with the driver protection, the BM5A's amplifiers are also thermally protected and will shut down if they get too hot. Bearing all this protection in mind with the inherent high power handling of the drivers, I'd expect the BM5As to be all but unburstable. Should they approach bursting point, however, an orange front-panel LED indicates bass/mid-range driver protection and a red LED shows amplifier temperature protection. Well built from high-quality parts. The BM5A is a high-quality professional product that is unlikely to disappoint. Worth the extra expenditure compared to apparently similar entry-level products. £881.25 per pair including VAT. TC Electronic UK +44 (0)800 917 8926.